In Essen’s Old Synagogue past and present are interwoven with each other. Acquired in 1959 and since maintained by the City of Essen, it served as a place dedicated to remembrance and historical (as well as political) documentation. Alongside these purposes it developed gradually and naturally into a cultural meeting point. The actual dedication marks the result of a long - and by no means linear - process which began, hesitantly and laboriously, after the fall of the National Socialist regime. On September 25, 1913 Essen’s Jewish community celebrated the dedication and inauguration of their new synagogue. 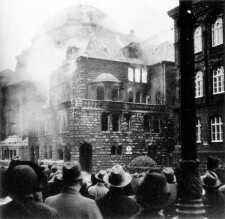 Like so many others in Germany, it fulfilled its original functions only until the Pogrom Night of November 9, 1938, when it was burned out. Despite intensive allied bombing of the city centre, the buildings envelope remained intact throughout the World War II and stood for many years afterwards as a ruined memorial to the city’s recent past. The postwar Jewish community in Essen, few of whose members had formerly lived in the city, suggested in the 1950s that the building be used for cultural purposes. Voices from Israel proposed a Memorial of the Shoah. In 1959 the City of Essen acquired the building, and about the same time the Jewish community built a small new synagogue in Sedan Street. Faced with the question of how to use the old, ruined synagogue, the city council decided to remodel its interior as an exhibition hall for industrial design. Following the soberly functional style of the age, it was stripped of all signs of its original use: Torah shrine and mosaics were removed, ornamentation painted over, and the imposing dome hidden beneath a suspended rectangular ceiling. Renamed “Haus Industrieform”, it became, for 20 years, a museum for industrial design. When a fire destroyed parts of the 1979 industrial exhibition, the City Council decided to use the building other than as a showcase for modern design. Accordingly, it turned 1980 into the “Old Synagogue”: a place of remembrance and a centre for historical and political documentation. Intensive restoration between 1986 and 1988 brought the former assembly room of the original synagogue to light, and Jewish culture gradually became a focal point in the centre’s program. On February 27, 2008, exactly 28 years since the rededication of the building to Jewish cultural purposes, Essen’s City Council decided unanimously to take a further step in this direction and transform the Old Synagogue into a modern cultural meeting place, a “House of Jewish Culture”, with new exhibitions, some interior refurbishments and a thorough reshaping of the immediate urban environment.